Last month introduced the concept of unit cells, where atomic forces hold the arrangement of atoms in a minimum energy, stable state. Visualize each atomic force as a tension or compression spring between each pair of atoms with all of the springs interconnected and balanced. Applying external forces to this atomic structure causes the atoms to change spacing within the unit cell. Tensile forces increase the spacing, while compressive forces decrease the spacing. Any displacement of the atoms from their stable state creates additional elastic stresses. The springs undergo an additional expansion or contraction. Remove the external forces and the extra elastic stresses disappear as the atoms return (springback) to their stable position. If the material has been permanently deformed into some geometrical shape, this stable shape creates a barrier to the release of the elastic stresses. Some elastic stresses will remain in the part, creating a temporary increased-energy state. These elastic stresses are called residual or trapped stresses. The springs want to return to their lowest energy state but mechanically are prevented from doing so. However, any subsequent deformation (offal trimming, hole punching, bracket welding, bending, etc.) will cause a further change in shape (springback) that reduces the total energy within the part. Fig. 1—Sketch A represents a mean shift a from the center of the target and very little variability. Sketch B has no mean shift but extensive variability. Springback problems usually fall into one of two categories—mean or average springback, and variable springback. 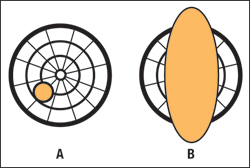 Target shooting has the same two problem categories (Fig. 1). One extreme (A) is a very tight grouping with very little variability. However, the mean (or average) value is not in the center of the target. This can easily be corrected by a mean shift from the current value to the desired value. Often this requires only adjustment of the gun sight or scope. The other extreme (B) is variability that occurs from shot to shot or from one series of shots to the next. This variability often is the interaction of many small variations and cannot be corrected by a simple mean shift. Condition (B) in Fig. 1 has zero mean error, but rarely does a shot strike bull’s-eye. Various forms of springback compensation are used in the press shop to shift the mean or average dimensional error of the part (Fig. 1A) from the wrong dimension to the correct dimension. Compensation often begins in the die design by over-bending, over-crowning and other changes that allow the part to spring back to part print. 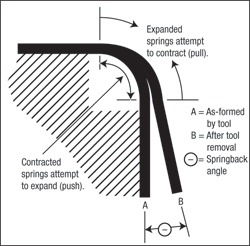 This requires the loading of the springs to be absolutely consistent from part to part—both before and after compensation. Unfortunately, most press shops undergo frequent and intentional mean shifts, and then wonder why their parts fail dimensional checks. “No two presses are identical” is a well-known fact of life in press shops—even new presses built to the same blueprints. Dimensional mean shifts occur when moving a die from the tryout press to the primary production press. Another occurs when the die runs in an alternate press. One study showed that the largest source of a dimensional mean shift was die transition. The optimum conditions at the end of the last run could not be duplicated when the die was reinserted in the press for the next run. One missing key element was the exact shut height of the ram(s); engineering changes to the die; simple maintenance over the weekend; changing the water-to-lubricant ratio; adding a shim. The list could go on. In each case, the fixed operating parameters of the forming system change. All of the springs in the part assume a new configuration. Three types of springback compensation typically are found in press shops. Fig. 2—The outer radius springs under tension will pull the sidewall open. The inner radius springs under compression will push the sidewall open. 2) Minimize the magnitude of the elastic stresses. The goal is to design the forming process to intentionally reduce the elastic stresses. The bend in Fig. 2 will be used as an example. One high-stress die design has the material flowing through tight draw beads and over a small die radius that creates a severe stretch bend deformation over the punch radius. The increased elastic stresses in the flange cause extensive sidewall curl. A low-stress die design is a simple overbend in a press brake. In between the two extremes, the blank-holder force becomes operative half though the stroke to provide the shape of the high stress design but at minimized stresses. Other techniques optimize clearances and minimize stretch components while increasing draw modes of forming. 3) Mechanically lock in the elastic stresses. Where part design allows, mechanical stiffeners can be inserted to prevent release of the elastic stresses and reduce various forms of springback. These include wall step flanges, stiffening darts, or even cosmetic enhancements. However, all elastic stresses not released remain in the part as residual or trapped stresses. Subsequent forming, trimming, punching, heating, or other processes may still unbalance the stresses and cause a mean shift.